Polar Elements, Other CD & Sound Bank from New Atlantis Audio. Polar Elements for Propellerhead Reason 4 features a set of playable Combinator instruments for your Reason rack. These 50 sampler-based Combinators are designed to "add serious depth and drama to your music," according to New Atlantis Audio. This pack has 50 instruments powered by 24 bit audio samples, all in a ReFill that weighs in under 14MB. These waves were made using a variety of special sampling and synthesis techniques. In one example, they sampled a bowed upright bass and, using additive synthesis, combined it with outdoor winter field recordings and an analog synth. 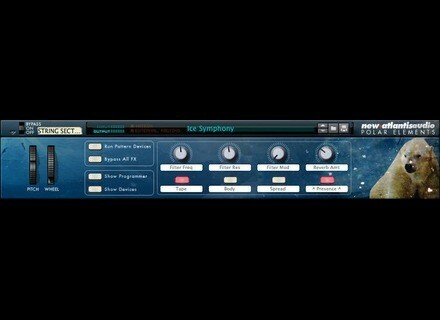 Polar Elements is available as a download from www.newatlantisaudio.com site for a limited time price of $5. McDSP Software Packs Shipping McDSP have announced they are now shipping the new Retro Pack plug-in line, Emerald Pack 4.0, Channel G Surround and Channel G Compact. Virsyn Presents FDELAY - The Rhythmiser Virsyn is happy has announce the release of FDELAY - The Rhythmiser. Soundtrack Loops Cinematic Synth Kit For Beatmaker Cinematic Synths is a collection of 4 separate beatpacks with 64 loops for Ambient, Glitch, Downtempo, Chillout, Trip Hop, Hip Hop, and Film Score.